The California harvester ant is among the most common and easily observed ants in the southwestern United States and is well adapted to desert life (CAS 2004). It is small and reddish-brown, and it has hairs all over its body, especially under its head. The hairs under its head make up what is known as the psammophore, which is beard-like in appearance and is used to carry loose sand (Pogolumina 2010). It also has very powerful mandibles, which are a pair of appendages near its mouth used for both harvesting seeds and protecting itself (Navajo Nature 2010). Without the adaptation of the mandibles, the primary source of food for the ant society, seeds, would be quite difficult to obtain (Navajo Nature 2010). Pogonomyrmex californicus is also well-known for its powerful sting that is administered by the stinger that protrudes from the tip of the gaster, or the terminal body part, to help ward off predators, as well as the potent venom that accompanies the sting (Pogolumina 2010). Yet another key adaption that the organism has developed is its high tolerance to heat. 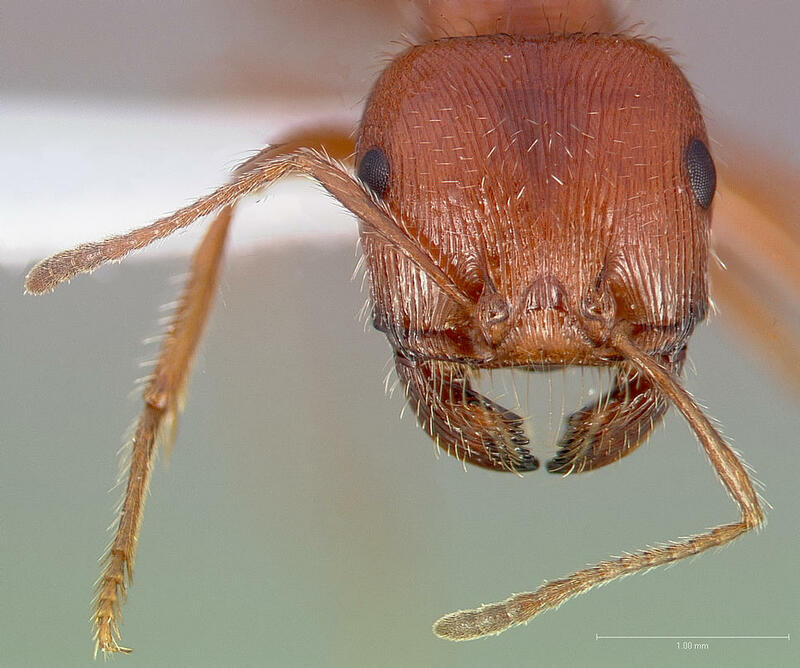 Studies show that this ant can tolerate a maximum temperature of 51 degrees Celsius, or approximately 124 degrees Fahrenheit (Quinlan and Lighton 1999). Pogonomyrmex californicus has a relatively small body size compared to most other species within the genus Pogonomyrmex, and that physiological adaption seems to be highly correlated to its high heat tolerance, as being small helps workers shed heat faster when heat-stressed (Navajo Nature 2010). These high temperature tolerances give an extra edge to the survival of Pogonomyrmex californicus over other ants because it lives in dry and arid desert habitats where the average foraging day can be well over 50 degrees Celsius (Navajo Nature 2010). P. californicus, using its many adaptations, reacts well to environmental stimuli. To explain, colony size is a fundamental attribute of insect societies that appears to play an important role in the organization of work (Holbrook et al. 2013). According to the same article, in the California harvester ant, the division of labor of certain tasks increases with colony size. Larger colonies perform more waste management and food processing per individual than do smaller colonies (Holbrook et al. 2013). Of course, Pogonomyrmex californicus would not be able to perform tasks without the use of its legs, which serve as its primary method of movement. These legs are yellowish in color, similar to the color of the mandibles (Wheeler 1914). The legs are designed for running, as they are powered by muscles in the mesosoma, the second body segment of the organism (ASU 2010). At the end of each of the six legs is a hooked claw that aids in climbing and hanging onto objects (ASU 2010).